We had our first rehearsal for the St. Louis Youth Symphony today, and it was a long one, from 10:30 to 16:00. It was cool though, we're playing really cool stuff, like the Beethoven Overture to Egmont, on top of Scheherezade. The rehearsal didn't seem that long at all, it was so fun. But yeah, as if I couldn't get enough of Powell Hall, I went back at night with Andrea to the SLSO opening weekend concert. It was definitely an awesome concert, all cool stuff. In light of the recent terrorist attacks, they played the National Anthem before the concert... standing up! The last time I saw a bunch of strings playing it standing up was the Air Force Strolling Strings, definitely a cool memory. And in memory of those who lost their lives Tuesday, they played the movement from the Mahler Symphony #5 that we played in Ladue High School Orchestra last year. Woah! I didn't realize they were playing that particular movement, I knew they were doing Mahler of some sort. And, the regular program was as cool played as on paper. Both Prokofiev and Tschaikovsky's Romeo and Juliet, and Berstein's Symphonic Dances from West Side Story. The weather was sooo nice today! Hannah and I took advantage of it and played violin outside. Then I gathered with the Angels and Paige and we took pictures. None of us have been all too happy with the pictures we've had in the past, so we decided to fix that. At 6, some people met up with us in the park and we took time to discuss and pray about Tuesday's tragic events. It was great to be able to talk and pray together with people that I cared about, I'm so glad we were able to get together and do that. Then I rushed over to rehearsal for the St. Louis Baptist Association Meeting on Sunday, and then to Ladue High School for a HOP Cinema night. I don't even remember what movie they played, all I know was it was too dark to make it out on the brick wall. But it a lot of fun, we all had a good time. Dan was there with his WRX, and I got to investigate the STI short-throw shifter that he just got in it. Wow! It's a nice short-throw, not one that causes you to misshift either. 2-4-R are still normal distances, but 1-3-5 are like 3/4" away from neutral. That's tight! It's amazing. So I finally remembered to get tickets for the St. Louis Symphony this morning, woke up early in fact to do that. I guess I shouldn't have been too worried about them being sold out. Well I'm holding off on too much with my car, too much is about to just literally fall apart. The faulty water pump has already ruined the serpantine belt, looking at the brakes lines causes one to grimace, and the engine vibrates ridiculously due to the cracked engine mounts. So it all had to get fixed. Wow, now the brakes feel so much nicer, with less pedal travel, and even the handbrake works properly now. And it runs very quietly and nicely now. But when my Mom was coming to pick me up at the shop when I was leaving my car, and elderly man in an 88 Taurus slammed into the rear-left corner of the van on Kingshighway. It was definitely his fault, though it was pretty miserable, cause the corner impact did not look very good on his car. The van just has a dent and a slightly bent bumper, so that's not too bad. Well, we got seatings tonight at the Wash U Symphony Orchestra rehearsal. The CDs for the Chamber Orchestra concert were also distributed today. I've put up 3 of the best pieces online on my music page. Well, today will definitely be a significant historical day. 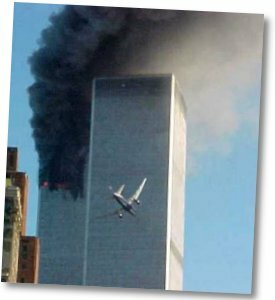 I awoke this morning to the news that two hijacked commercial airlines jets had crashed into the World Trade Center in New York City, and I sat there and watched both towers come crumbling down. 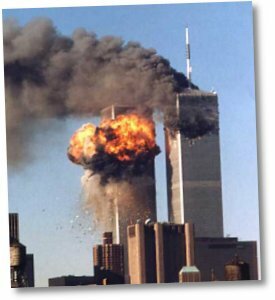 The Pentagon was the third target that was successfully hit by another hijacked Boeing 757. 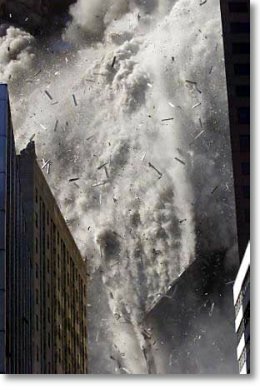 The tragedy is great, as 40,000 people work in the Trade Center, and there was little time to evacuate everyone. The entire country has been thrown to chaos, as businesses close, classes get called off, and people just simply try to deal with the idea that we've been attacked. The panic has spread to things like gasoline prices, as people are panicing that the oil supply is going to get cut. People have flocked to the gas stations, and the stations, in fear that they will run out of gas, have upped prices to even $5/gallon at certain places. The attack today is definitely a big wake-up call to the country. Today, we unfortunately witness evil human nature in a more raw form than usually seen in this wonderful country. A few things dominate my thoughts. First, I am thankful we can live in a country where we don't see such evil in such raw forms of destruction of life daily. There are places in the world where tragedies of this magnitude are a more common occurance. It shows how soft our hearts are, because living here, we are definitely shielded from a lot of grotesque evil in this world. And I'm thankful for that. And it also makes me thankful for everything here, and all the people that are around me that I love and are still here. This tragedy is definitely testing a lot of people's faith, including faith in the country. If nothing else, let this incident strengthen our faith. No longer should we think that we are in such control of our own lives. So quickly and swiftly, two magnificent towers that symbolized control over our lives, our money, and our well-being came crumbling down. But I believe that if we trust God, the great country of United States of America, we can get through any type of tragedy that may strike us now or in the future, because God has blessed us with what we have now. Having only 2 classes today gave me the time to do some things like visit Ladue High School. I also had my mechanic check this noise coming from the bottom of my engine, and he suspects it's the water pump. Argh. It'll be a good $180 fix. We had our first seating audition for the Wash U Symphony today, no biggie, just a few measures, so it's all good. Otherwise, I had a pretty typical Sunday, did some homework, some chores.